To effectively manage potential environmental and human health impacts of contaminated river sediments, it is important that information about the source (anthropogenic vs geogenic), variability and environmental risks associated with the contamination are well understood. The present study was carried out to assess the source and severity of contamination and to undertake a risk assessment for selected elements (As, Cd, Co, Cr, Cu, Fe, Mn, Ni, Pb, V and Zn) in river sediments in Serbia. The estimate of the anthropogenic component of contamination was derived by determining the total element content and the background values for elements in sediments, and the severity of pollution was assessed by calculating a number of pollution indices including the contamination factor, the enrichment factor, the index of geoaccumulation, the ecological risk factor, the potential ecological risk index, the pollution load index, the combined pollution index, the modified degree of contamination and the toxic unit factor. This analysis indicates that river sediments in Serbia are primarily polluted with Zn, Cu and Cd. The most contaminated river systems are the Ibar, Pek, West Morava and Great Morava rivers. Mining activities were found to have a significant influence on sediment. Multivariate analyses suggested anthropogenic origins for Pb, Zn, Cd, As, Ni and Cu, whilst Fe, V, Mn, Co and Cr appear to have a mixed origin (both lithogenic and anthropogenic sources). 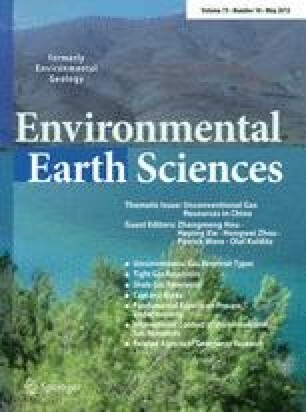 A geochemical approach, with a calculation of pollution indices and statistical methods, is recognised as useful for the risk management of trace elements in sediments around the world. The online version of this article (doi: 10.1007/s12665-014-3886-1) contains supplementary material, which is available to authorized users. This study was supported by the Ministry of Education, Science and Technological Development of Serbia, Grant Nos. 172001 and 43007. In addition, we would like to thank the Republic Hydrometeorological Service of Serbia for the sediment samples.